In this article, we will cover what makes the best email signature generator, and how to pick one that works for you. Ensure your private data is not being sold. Your data should be safely stored, without chance of theft. The email signature solution must be right for your business. This is one of the most important steps to choosing the best email signature generator. Would you give all that information to a random person on the internet whom you don’t know? Of course not! Your personal data is incredibly valuable. You don’t want anyone that isn’t authorized to have access to it. This is why it’s important to know how your data is being protected, and if it’s possibly being sold. In fact, various companies throughout history have been known to sell personal data. They provide “free” services to users, where they collect the user’s information and then sell it to marketing agencies to make a profit. So, when you use “free” services, they might not be so “free” after all. You should also check to make sure the website uses an SSL certificate to make sure your data isn’t being tampered in transition. If the company uses its own payment gateway software that they have created, look for an alternative email signature maker. The email signature tool should be integrated with a popular payment gateway such as Stripe or Paypal. These companies spend millions of dollars to ensure that credit card information is never exposed or leaked. When you use an app that is integrated with a popular payment gateway, you know that all your payment details are stored safely on their servers. Client Based – Adding email signatures to Outlook. Server Based – Adding email signatures at the mail server level. This method injects email signatures to all your outgoing emails without you having to change anything in Outlook. Both methods work great, but the method you choose should entirely depend on how many staff you have and the budget. Client Based is suitable for businesses that have up to around 300 staff members. This is the cost-effective option which is easy to set up using the right email signature creator. The downside is that everyone will have to update their email signatures in Outlook manually. However, once its set, you can forget about it. 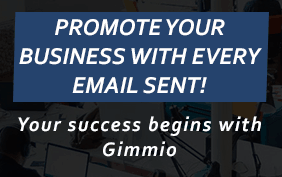 Gimmio‘s email signature generator is a great example of a client based option. Server Based is suitable for a business with over 300 staff. This option is more expensive and usually takes a lot longer to set up. There are also privacy concerns when using this method as all your emails get routed through a third party which can record or keep all of your sent emails. A good email signature generator should have at least the following features. If it doesn’t, look elsewhere now! An easy to use interface, that is simple to navigate and understand. Compatibility with all the popular email clients like Outlook, Apple Mail, Gmail etc. Rich in features like grouping, duplicating, editing and sharing of email signatures. Compatibility with other applications that use email communication like CRM’s, newsletter services. Plenty of email signature templates. Ability to add a banner to your email signature. Be able to position your logo or banner wherever you want in the email signature. An active and vibrant support team. Remember, it’s difficult to re-create all your company’s email signatures, so make sure you choose the right tool from the start! Otherwise, you will have problems later down the track. Consider any other tools you use for email communication and whether the email signature maker will be compatible. For example, if you’re using a CRM, make sure your chosen tool is compatible so you can attach email signatures to it. Also, if you send email newsletters, double check your email signature will be compatible with your provider. In summary, you should take your time to test all the functionality carefully before committing. There are so many email signature builders out there which simply aren’t made well and create more hassle than its worth.